Emory & Henry College is holding Wasp Junior Academy soccer camps at July 24-27, for kids of ages 5-13 at Emory & Henry College. The Wasp Junior Academy is an intense experience designed to provide aspiring soccer players a preview of the rigors of a typical preseason training day with Emory & Henry’s women’s intercollegiate soccer team. This training opportunity is also a great way to visit and tour the Emory & Henry College campus. Athletic Summer Sports Camps run every year at Emory & Henry College to improve game with professional coaching and expertise. As a Division III institution, Emory & Henry College’s athletics subscribes to the notion that their athletes are students first and to the belief that the virtues of athletics – a healthy body, team work and the quest for improvement – are important in so far as they enrich your life in areas beyond athletic competition. This philosophy has served them well in the production of quality graduates who once competed for Emory & Henry, cheered on by their professors and other college employees as well as fellow students. As an E&H student athlete you may well join a long list of current and former student athletes whose lives have been changed by the support they received on and off the athletic field from people across this college community. The coach, McCallie Jones is a bright, talented young coach who has a strong vision for how she wants to develop the program. Having worked as a full-time assistant coach at the Division III level she has given her the full array of experiences in the day-to-day management of a college women’s soccer program. Come join in the fun and improve athletic skills and abilities at Wasp Junior Academy to improve game with professional coaching and expertise. 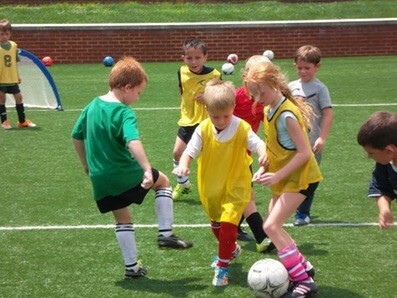 Emory & Henry College is holding Wasp Junior Academy soccer camps at July 24-27, for kids of ages 5-13 to improve game with professional coaching and expertise.